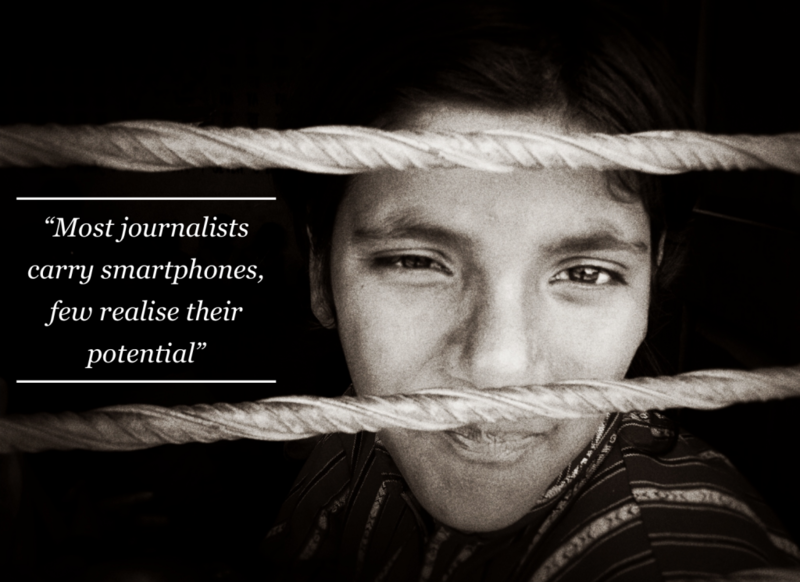 Most journalists carry smartphones but few realise their potential as a multifunctional tool. It’s as if a TV camera had an SLR stills camera bolted on. Then add to that an audio recorder, a satellite dish, an editing suite and a computer and it all fits in your pocket. It sounds too good to be true and unfortunately it is. Don’t think a mobile phone can replace professional equipment. It can’t. But it can stand in if things don’t go as planned. Whenever I am on assignments I always carry my mobile phone along with a small kit of accessories which I know I can rely on if disaster strikes. , D J Clark discusses the use of a mobile phone as a journalistic tool. In this chapter I will take you through some basic lessons on how to work within the limitations of the phone and still produce profesional looking multimedia news packages. The trick is to compromise on what your professional kit can do and play to the strengths of the phone. D J Clark outlines his assignment in Nepal and how he intends to use his mobile phone to complete it. All the photographs and the video packages that appear at the end of the video editing section have been produced with an iPhone 4 while I was on a series of assignments in Nepal. A local NGO, SWAN, that provides education, health and social services to communities in the Baglung district had asked me to follow one of their fund raisers, Ian Craig, who was on a short visit from the UK. I left my professional kit back in Kathmandu and accompanied Ian only with my phone and a small kit of accessories I keep for emergencies (all laid out in section 2). Over the following three days we trekked through the area and I sent text, photographs and a video package from the field directly to the SWAN main office and onto social networks used by the fund raisers to promote the NGO’s good work. Going mobile: What’s covered in this module? In the last of three videos introducing this chapter, D J Clark outlines what is to come in the following section. In the first section I lay out all my accessories for the mobile phone onto a table and go through them one by one. In the second section I explain the shortcomings of the camera on the mobile phone and how you can work to overcome them. I then give tips on the best way to shoot video with a phone. In the third section I move onto video editing on the phone using Apple’s iMovie APP. The section covers using the APP, adding voice overs, finishing the edit and compressing and sharing. It’s easy to create and do basic edits on the phone as long as you keep things simple and you learn how to compress them after you have finished so the files are small enough to send, even with a weak 3G signal like I had in Nepal. Moving away from video the fourth section is a quick look at the camera on a phone for still images. I show some of the pictures that worked and some that did not exposing the weak points of the phone. I also give some tips for editing photographs on the phone using some of my favourite APPs. In the final section I cover just a few other Apps you might want to get your head around for various journalistic tasks. Plus some useful APPs that just makes the job a little easier. Every month a new phone comes onto the market along with hundreds of new APPs and therefore make sure you have the latest version of this iBook and also check the Multimediatrain.com website for any new phones or APPs we may recommend. The technology just gets better so anything you see in this book, with a more up to date phone you should be able to improve on. Also remember to practice and enjoy using your phone while you are not on assignment. Uploading photos to social networks like instagram and videos to youtube of your daily life will help familiarize yourself with the phone’s potential so if it is ever called into action you will know what to do.